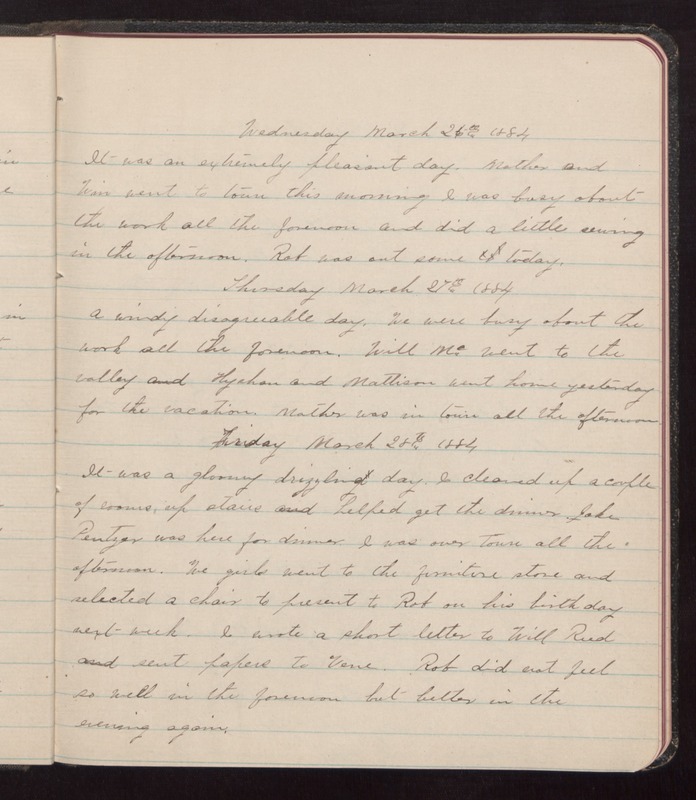 Wednesday March 26th 1884 It was an extremely pleasant day. Mother and Win went to town this morning I was busy about the work all the forenoon and did a little sewing in the afternoon. Rob was out some of today. Thursday March 27th 1884 A windy disagreeable day. We were busy about the work all the forenoon. Will Mc went to the valley and Hysham and Mattison went home yesterday for the vacation. Mother was in town all the afternoon. Friday March 28th 1884 It was a gloomy drizzling day. I cleaned up a couple of rooms, up stairs and helped get the dinner. Jake Pentzer was here for dinner I was over town all the afternoon. We girls went to the furniture store and selected a chair to present to Rob on his birthday next week. I wrote a short letter to Will Reed sent papers to Vene. Rob did not feel so well in the afternoon but better in the evening again.